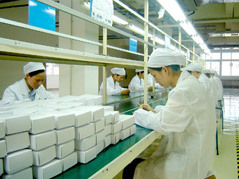 We established manufacturing operations in China with our first electronic assembly plant in 1993 to take advantage of the low labor cost and close to source purchasing of electronic components. As we expanded our business and began manufacturing finished medical devices, we found that our customers can also benefit from our Asian manufacturing group with lower tooling costs in addition to the lower costs for assembly labor. Starting with their initial capital investment, our customers will find savings of up to 50% or more on the cost of tooling up their product. With the well vetted group of local plastics mold tooling suppliers we have evolved over the years, we can go from design to hardened steel tooling for little more than our customers would typically pay for soft, limited shot tooling in the U.S. or Europe. And with customer approval required on initial mold shots prior to Sanbor taking possession of the tooling, our customers are assured that the finished plastics for their device will be what they expect, not simply what we can produce. Customers also benefit from our cost effective purchasing of raw materials direct from the manufacturing sources located in Asia. This ensures a maximization of operating margin and best price point advantage as the products are brought to market. In addition, we undertake cost reduction initiatives jointly with our customers through testing and validating equivalent components. © Copyright Sanbor Medical - 2019. All rights reserved.